Sports commentators like to keep their hands free, when broadcasting events so they can take notes, make statistics, process documents and work with their computers. In many cases, the commentary booth opens out onto an event so that the commentators have a clear view of the action on the ground. However, this causes a lot of ambient noise, especially crowd noise. It is therefore imperative that the headset of a sportscaster is well insulated, and the microphone has an excellent off-axis rejection to avoid unwanted noise. 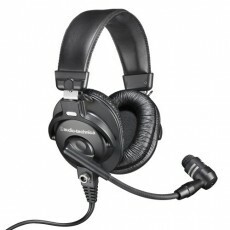 With this in mind, Audio-Technica engineers worked to design the BPHS1 headset which is now highly acclaimed by leading TV channels and professional radio broadcasters.